We're touching this week on the Millionaire Gent Aesthetic and how to wear certain articles of your clothing appropriately. In years past white was reserved for certain events, season and time of day however that has definitely changed. 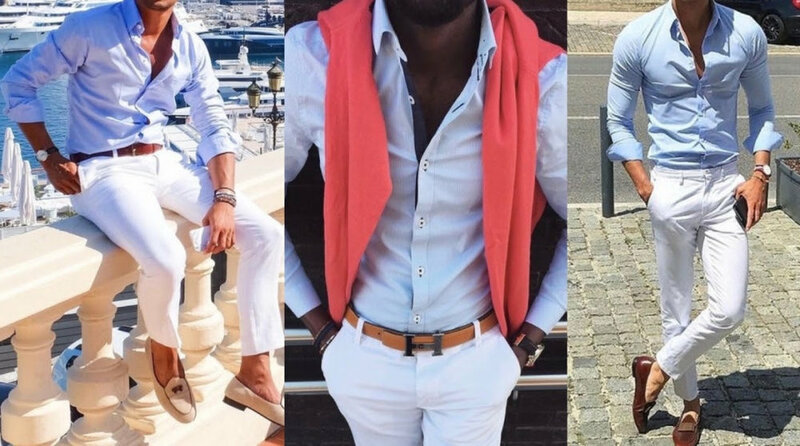 From having all white affairs, more formal and casual events, a gentleman should have some white in his attire. No posers allowed! You have to be bold and confident in yourself and sense of style to properly wear a white pair of trousers and with saying such, I need to start with the truth about white pants.. they aren’t for everyone. If you are plus sized you should definitely avoid wearing white pants because they highlight tight areas. It may make you appear bigger than you are. When wearing white pants you should always go for a slimmer fit. It should give you a more flattering look on your legs, but not tight, you need some room to give the pants the best look. Having the right length of the pants is important. 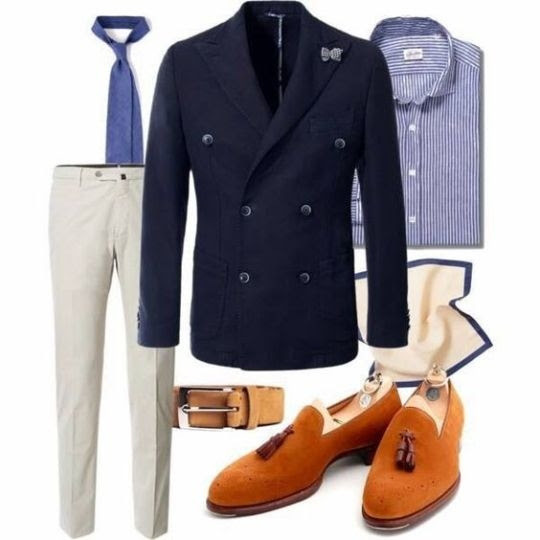 Try having no break in the pants so that not too much of your ankle is showing, you don't want to appear taller than you are and too much of folded, wrinkled fabric on the end will make your pants look too long for you and it won't compliment your look no matter the other parts of your attire. The length of your pants should fall so that no matter what shoe you wear it will look good. Good Morning my fellow Millionaire Gents and yes I am a Dr. Who fan, he does carry a gentleman aesthetic and manner after all. Okay so let's get to it, in the last newsletter we touched on becoming and staying debt free, I want to continue along that vein and discuss something you can do to assist you in staying debt free and automating your wealth creation process. A very simple step you can do is at your bank you can create additional accounts to redirect portions of your income, you set up what is called a standing order. A standing order is an instruction to a bank by an account holder to make regular fixed payments to an account, particular person or organization. If you want to be a bit more strict, you can use other financial institutions that aren't easily accessible and don't take debit or credit cards as the goal is to keep physical access to the funds to a minimum. There are institutions such as credit unions where your funds purchase shares and they give you much better interest rates but there is a process to withdraw the funds so look for these sort of institutions in your area. The main goal of automating the process is so that you don't have to physically divide the money yourself to make payments into the accounts, it's all done for you, this will help you stay disciplined in your efforts. I'll probably do a newsletter on different institutions and what they offer as investments to grow your money at a later date. As always you know I like to keep these newsletter short and to the point. If there are any topics you would like me to cover or questions, send me an email or leave me a message on the Facebook resource page as well. As The Millionaire Gent, you'll learn two things, the wealthy don't work for money and it's not about how much money you make but how much you keep. With this in mind the first thing you need to do is erase any debt you may have. Exactly how do you do that? As a Millionaire Gent one of the things you need to learn is how to pay yourself first. A big mistake alot of gents make is trying to save after they paid all their bills and expenses. That is the quickest way to have NOTHING! There was a time I was in a very bad place financially, I had approximately $90,000 in debt, literally living cheque to cheque to pay that off, business was dead and no free income to do anything so I had to brainstorm a way to get of that debt quick. I did some research and came across something called the 6 jars System - www.6jars.com This system helped me create a method to allocate my money appropriately. The beginning as with any new habits was difficult, I missed on it a couple months but eventually I stuck to it and got out of debt within a 18 months after having acquired debt for over 5 years. Now that I had my debt cleared I ensured that I didn't recreate that situation, no more hire purchases and maxing out of credit cards just because I felt like Ballin' on a weekend. I created a new method after eliminating debt, the 10-10-80 Rule. Which simply states 10% to Gifting, 10% Saving, 80% to do everything else. Of-course you can break down your 80% further or increase it to match your present financial needs. Here is a great video I found on it that will explain it further. Note the video mentions bible principles but my goal is for it to help you understand the 10 10 80 principles. There you have it gents two great ways to become debt free, you know I don't like to have lengthy newsletters. Next week I'll be expanding a little more on this same topic so look out for it. As always if there are any topics you would like me to cover or questions, send me an email or leave me a message on the Facebook resource page as well. Today we are going to close off with D, which stands for your Digital Presence, it is where it all comes together as many of us have a life online as we do offline, but what does it say about you? Does the things you share online display the image you want for yourself. If I was to google you right now would what I find display a millionaire gent or a questionable gent. You display your appearance through personal photos, your behavior through the things you show you're interested in and how you communicate in the comments you leave on posts on social networks and forums. You may think noone cares but oh yes they do and they are making their own perception about you by what you present online. Do you know that companies look online at persons that applied for employment or to see what their present employees are doing and possibly saying about where they are employed. Even people that may be considering you as a business partner are observing what you do. I'll give you a personal example. When I started my business as I promoted myself online, little did I know a gentleman was observing me. I was literally having lunch, he found my number on my blog, called, explained who he was and he said because of what he saw me doing online he wanted to help me, and because of him I got my first contract to charter jets the very next week. That man to this day has been a good friend and we've never met, it was all because of my positive presence online. Situations like this has happened multiple times since then catapulting my business and network. Don't get me wrong I'm not saying not to express yourself on your social network profiles but I am saying still be wise with what you share. Take the time over this week to do some inspection, look at what you share and ask yourself if you are displaying the image you want for yourself and how you want people to think about you. The free Gents Tips you would've received in the previous newsletters will help you fine tune the areas you need assistance. For the gents that subscribed recently here are the three tip sheets and resource that was shared previously..
As always if there are any topics you would like me to cover, send me an email or leave me a message on the FB page. Gents I took the last week to curate the THE MILLIONAIRE GENT Facebook page. I decided to create this page as a resource and also another way in which you can connect with me and ask questions. It will have many tips on proper attire, etiquette, lifestyle, and of-course developing your wealth mindset. Remember the Millionaire Gent is about having a wealth mindset and it's aesthetics as you develop yourself into becoming the next millionaire or billionaire. Be sure to like the page, share and encourage gents to subscribe so they can be part of our journey as the newsletter will have exclusive offers that may not be shared on the FB page. If there are any topics you would like me to cover, send me an email or leave me a message on the FB page. Good Morning it's another week and we're still on learning your ABCD's on developing your millionaire gent image. I hope you're seeing how each area is connected. We've touched on your Appearance, your Behavior and now we'll move on to Communication. Let's start with something very important and that's listening to understand and not to respond – Too often I’ve seen folks in conversation reacting and responding before the other person has finished speaking. As a millionaire gent you should be an exceptional conversationalist because you've mastered the art of listening. Listen with intent, receive the full message being communicated and process it instead of waiting to reply. Always let the speaker finish, don’t interrupt unless you need a point clarified or something else requires your immediate attention outside of the conversation. Articulate and Enunciate – Ever so often in these newsletters you'll realize I always encourage that you read more, not only for knowledge but because it helps with your vocabulary. Being able to use a cornucopia of words and displaying excellent verbal expression is a good thing, don't worry about those that may think you're showing off. The key is using the right words at the right time without coming across as though you’re trying to showcase you have some sort of academic accolade. What’s the point of all that vocabulary if no one understands you. Gents, also please think before you speak, most times people fumble because they rush to speak to be part of a conversation when they have no knowledge on what is being spoken about. Just listen, enjoy the conversation and enjoy the company you don’t always need to be a contributor. As always I have a Gents Tip Sheet for you, it covers proper etiquette for business and social communication. After reading feel free to email me your thoughts or any questions. Well done getting this far gents, let's keep pushing. Good Morning Gents, it's another week and we're still into learning our ABCD's of personal image. After A does come B so we're going to address your Behavior as you're developing your millionaire gent image. Just as your attire introduces you before your speak, your behavior screams even louder. You do not want to be a well dressed pig that noone wants to be around. As a millionaire gent when you enter a room and engage others your personality should say that you're confident, refined, and intelligent, not boisterous, lewd and unmannerly. What I have noticed while helping gents improve on their image was that their own thoughts about themselves hindered them from improving. Don't let your thoughts of the person you was keep you from being the person you want to become. This is why at the beginning when we started our journey as Millionaire Gents we spoke about reading more and developing your mindset, it is all connected. To help groom your behavior it is important that you build habits around specific traits, it is vital that you engage in SELF INSPECTION, be CONSISTENT and TRUSTWORTHY. As always I've put together a special Gents Sheet just for the gents that have subscribed. On this Gents sheet you'll get more behind improving your image, those traits and simple etiquette tips to help enforce proper gentlemanly behavior. Gents, we're back at it again. I gave you two weeks off to get through those books, I hope you took the time to read them, if not, the audio versions are there for you free on You Tube. This week I want to talk you about your ABCD's. No not the alphabet you learned as a child. This is in relation to you developing your millionaire gent image. It stands for..
Let's start with your Appearance. There is a reason why they say "dress the way you want to be addressed" and "dress for the job you want". It's because people do treat you differently when you dress better. I can tell you about the number of times the minute I wore a suit how people spoke to me as though I wasn't the same person they spoke to the day before. One lesson I've personally learned is that people like to do business with others that dress equally or better than they do. It's part of that non-verbal communication we engage in every single day. However, do you realize that the way you dress right now shape your mindset, the people and the environment around you. Think about it I'm certain most of your friends dress exactly like you and you all go to the same places and even speak a particular way. Drop a message in the comments below and let me know what you think you need to do to develop your millionaire gent image. Gentlemen, picture this with me. Think of when we eat unhealthy and we don't exercise, many of you are still on a "See Food" diet, whatever you see you eat but the talk about exercise is a future post so anyway... What happens, you gain weight, you lose energy, all sort of health issues start coming up all because you weren't feeding your body the proper nutrition it needs to function as well as keeping active. Now let me tell you.... are you ready... the same thing is happening to your mind. It is impossible to develop the wealth mindset if you aren't feeding your mind the right things to help it develop and furthermore being active with taking what you're feeding your mind and putting it into action. Your thoughts are what help you create your reality so if you're feeding it garbage, it will be trash in, trash out. Poor thinking cannot generate wealth so how do we begin to shift this? It is important that you begin to read more. The top CEOs of the world read 4 to 5 books a month. Warren Buffet dedicates 80% of his day to reading. Okay calm down I can already hear you whispering I must be crazy, don't worry I'm not asking you to make such a big leap into reading, that is something you'll develop over time. These three are short books that you can read within an hour or two. For the next week I want you commit to reading a minimum of two of these books. You can do it, you want to develop your wealth mindset, don't you? Be sure to leave a comment below about what you took away from any of the books. The difference between people that are wealthy and those that are poor is their perspective toward money. The wealthy think about their money and the poor mostly worry about their money. Wealthy persons engage in more proactive and constructive thoughts about how to earn more, keep more, and spend less of it, whereas the poor generally worry about not having enough of it or where they'll get more. To be able to develop your wealth mindset, you’ve first got to start at the foundation of what your thoughts are about money. Most people live paycheck to paycheck and many barely have anything in checking and savings accounts. When was the last time you made a budget, when was the last time you listed your expenses and your income. On a piece of paper list out all your expenses such as your Rent/mortgage, Car payments Credit card bills, Groceries, Utility bills etc Try to include all the monthly expenses you may have. Then write down your monthly income from your day job and any other revenue streams. When you add up all your expenses and minus it from your income. How much do you have left? Let's hope what’s left isn't all that you have in your bank account. Think of all the things you spend your money on... Clothes, Entertainment. Wealthy people know how much they spend and how much they have in the bank. Evaluating your finances can be a harsh truth to face but you can’t take control of your finances if you don’t know what shape it’s in. Now that you have an idea where you're hemorrhaging money, figure out how you can stop or curb the spending. The very simple reason you want to spend less is so you can have more. At the beginning of this article, you read that the difference between wealthy people and poor ones is that the wealthy think about money, whereas the poor worry about it. Well, here is another difference: Wealthy people HAVE more money. It’s not necessarily because they earn more, but it’s definitely because they keep more. According to a 20-year study by Tom Stanley and William Danko (which became the book, The Millionaire Next Door), wealthy people save or invest 20% of their income, compared to the five percent or less average for others. By finding ways to keep more and spend less, you will have more money next month than you did this month. (Put it in a savings account, envelope or in the cookie jar.) It adds up. Make it a game or a challenge. If you eat out a lot, preparing your meals at home can save money every week. Pay off any of your credit card balances. See how much you can save on your electricity bill by making sure no lights or appliances are left on unnecessarily. People who do not have very good control of their money also do not have very good control of their credit card bills. Late payments result in late fees and, sometimes, increased interest rates, both of which eat into your wealth. One of the best ways to prevent fees and higher interest rates is to automate your bill-paying. Most credit card companies give you the option to create an online account and monthly automatic withdrawal from your checking account to pay bills. If you’re the kind of person who forgets to pay until it’s too late, this is the way to go. While it’s necessary to reduce expenses, especially when just starting out on your way to wealth, shopping for cheaper, low quality items sometimes end up costing you more in the long run. Rather than shop for the cheapest, look for the best value. You can apply this to more your frequent purchases like food and clothing: when a particular food item you use often goes on sale, stock up on it and save future dollars. Cheap attire will wear out faster and need replacement; buying better quality items may cost more up front but you purchase less in the long run. While a considerable part of wealth consists of saving money and eliminating wasteful spending, you can’t ignore the importance of increasing your income. It’s said that the average millionaire has seven income streams. That may or may not be true, but one thing is certain: it’s better to have multiple income streams than to have only one. There are many ways to create additional income streams. Here are some: Learn about the stock market and start investing. Start a home-based business on the side. Sell products through Amazon.com. Write a book and sell it online. Drive for Drop Taxi Service, Uber or a similar service. When you start thinking in terms of bringing in more money, you will seek out and become more aware of ways to do it. Ideally, you want to find some ways that create income without requiring you to work more hours. Do your research and figure out one new income. Once that is established you can move on to find another and develop that. Work on these five things and they will get you to think like a wealthy person and you will be on your way to attaining greater wealth. Check out the video below as Tony Robbins shares some ways to help you condition your mind to wealth. This is week 2 , gents you're doing great, let's keep going.. The Millionaire Gent is more than a man wearing a suit, designer clothing, driving a luxury car or living in a luxurious house. The Millionaire Gent is a MINDSET, just as poverty is a mindset so is wealth. The Millionaire Gent aesthetics is man of intelligence, influence and affluence. We want to start changing the discussion about building wealth and generational wealth especially, however we need to address the mindset first. In order for the things around you to change you need to change the way you look at things. The traits you have now would be because of things you picked up from your parents, your environment, habits that became part of your lifestyle and ever so often life tend to throw in circumstances that would test your fortitude so we need to look at how you presently look at your life. There is no right or wrong answer only honest ones. Let us know in the comments what are the areas of the life you saw you need help in balancing, this will help us create content specifically for you and get you the help you need. This is Day 1 and we want to congratulate you on taking this step.